For Immediate Release: Posted On 11/30/2011 By Industrial Magnetics, Inc.
Industrial Magnetics, Inc. now offers 2 different styles of magnetic pull test kits used for testing the strength of a magnet to determine how effective it will be in its given application. A magnetic pull test can be used as part of a regular quality control program or to compare two magnetic devices that look very similar on the outside, but may have different magnetic circuitry or magnet material on the inside, resulting in either a more or less effective magnet. Magnetic pull strength testing can be performed on magnets with round or flat surfaces and on either permanent or electromagnetic circuits. Pull strength is determined by using a calibrated scale, offered in a handheld or digital model, and a ferrous test piece. The pull strength, or pounds of pull it takes to release the test piece from the magnet, indicates the strength of the magnet. IMI’s 12 piece Pull Test Kit comes in a hard case and includes a variety of ferrous test pieces, air gap spacers, a polarity tester, a Magna View green sheet, a ruler and either a hand-held or digital calibrated scale. 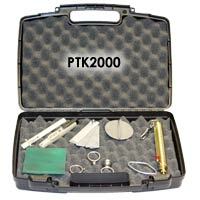 View additional information and order online capability for the Magnetic Pull Test Kit.